One of the research team, Dr Ian Garrard from Brunel University, used an ultrasonic distance sensor to record how close each vehicle passed during his daily commute in Berkshire and outer London. 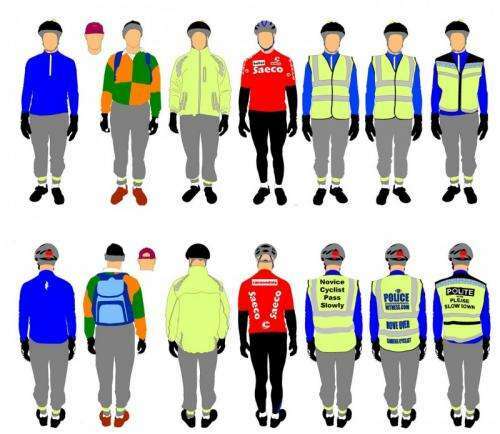 Each day, he chose one of seven outfits at random, ranging from tight lycra racing cyclist clothes (signalling high experience) to a hi-viz vest with "novice cyclist" printed on the back (signalling low experience). He sometimes also wore a vest that said he was video-recording his journey, or a vest modelled on a police jacket but with "POLITE" printed on the back. The same bicycle was used every day, and was always ridden in the same way. Over several months, data were collected from 5690 passing vehicles. Dr Ian Walker from our Department of Psychology, who led the project and analysed the data, said: "Many people have theories to say that cyclists can make themselves safer if they wear this or that. Our study suggests that, no matter what you wear, it will do nothing to prevent a small minority of people from getting dangerously close when they overtake you. "This means the solution to stopping cyclists being hurt by overtaking vehicles has to lie outside the cyclist. We can't make cycling safer by telling cyclists what they should wear. Rather, we should be creating safer spaces for cycling – perhaps by building high-quality separate cycle paths, by encouraging gentler roads with less stop-start traffic, or by making drivers more aware of how it feels to cycle on our roads and the consequences of impatient overtaking." Whilst this study also found that hi-visibility vests and jackets made no difference to the space left by overtaking drivers, it did not try to look at whether these devices made cyclists more visible at intersections or at night. However, the researchers do note in their paper – soon to be published in the journal Accident Analysis and Prevention – that there is surprisingly little evidence that high-visibility clothing for cyclists and motorcyclists offers any safety benefits in daytime. This would further support the idea that there is no easy fix for riders' safety from asking them to wear bright clothing. Although there are cyclists hurt on our roads, it is important to remember that cycling carries major health benefits from providing regular exercise. This means that, on balance, it is much better for people's health that they cycle than that they not cycle for fear of injury. The research team are all regular cyclists. Dr Ian Walker and Dr Ian Garrard cycled together from Land's End to John o' Groats this summer.